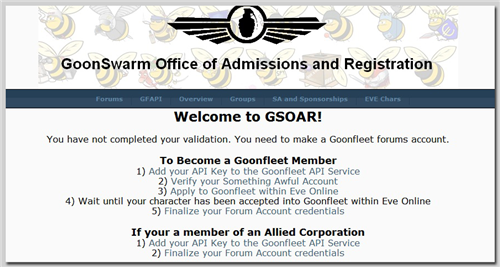 This guide will help you complete the GSOAR process to join GoonWaffe. If you have a valid Something Awful account, then complete steps 1, 2, 3, 5, 6, and 7. If you are being sponsored, complete steps 1, 2, 4, 5, 6, and 7. If you have any problems during the process, first check the Known Issues section at the bottom of this page. If you are unable to solve your problem, note the step you were at (e.g. Step 1.c) and ask for help in the in-game channel SOLOHELP. GoonWaffe is NOT a publicly recruiting corporation. We are all members of the Something Awful forums, or well-known friends of someone who is a member. 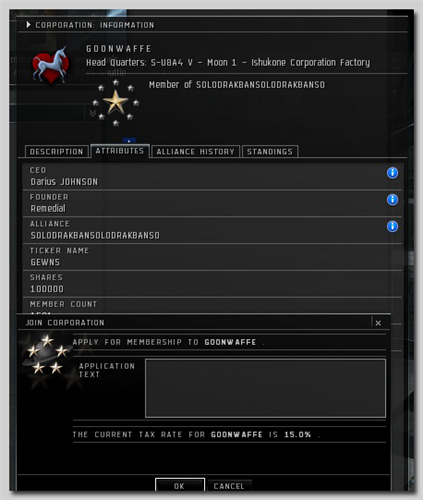 To join GoonWaffe you MUST either be a member of the Something Awful forums and have been an active member for at least 3 months, or you must have a sponsor who is a GoonWaffe member of good standing who is willing to vouch for you, meets the above requirement, and has been a member of GoonWaffe for a month. If you do not meet the above requirements then you can not join. 1.e Click to Continue your registration. 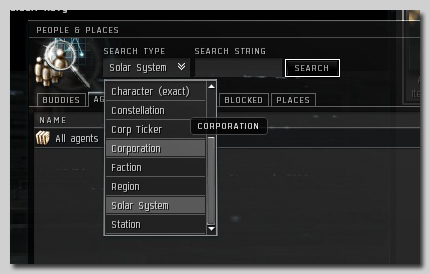 2.c Visit https://www.eveonline.com/api/ (you can click the API Key link shown in Step 2.b.) For this step only your Limited Access API is needed. 2.f You have successfully added your API Key to your GoonWaffe forum account. To continue, click SA and Sponsorships. IF YOU HAVE A SOMETHING AWFUL ACCOUNT, CONTINUE TO STEP 3. IF YOU ARE BEING SPONSORED, SKIP AHEAD TO STEP 4. 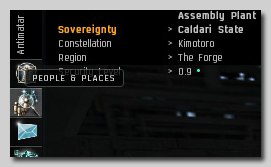 When adding your API into GSOAR to put in your characters you may just get a white screen. First try to refresh and resend the page a couple of times to see if that clears it. If not, try backing your browser up the same number of times you refreshed. This is not guaranteed to work but has been successful in the past. 3.b Enter your SA forum name and click Begin Process. 3.c You will be provided a code (starting with SAGF-) to insert into your SA profile. You can get to your profile by clicking the link Something Awful Profile. 3.d Insert the provided code into your profile, and click Submit Modifications. 3.f Click Verify Account. At this point either GSOAR will complete your verification if you meet the requirements, or you will be told that you are awaiting manual authorization. At this point you will apply to GoonWaffe in game (Step 5) and wait to be accepted. The next section is on how to request a sponsorship, so you can skip to Step 5. THIS PROCESS DOES NOT GENERATE A NOTIFICATION OF ANY SORT TO YOUR SPONSOR. IT IS YOUR RESPONSIBILITY TO CONTACT THIS PERSON TO HAVE THEM APPROVE YOUR REQUEST. 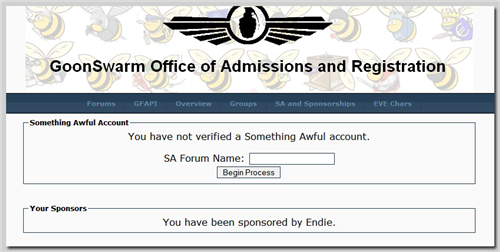 5.e IF YOU ARE SA OR SPONSORED YOU DO NOT NEED TO FILL OUT THE APPLICATION TEXT FIELD. IF YOU ARE NATURALIZED OR AN OTHERWISE SPECIAL CASE PLEASE PUT YOUR GF FORUMS NAME AND YOUR SITUATION SO THAT YOU CAN BE MANUALLY VERIFIED. Click OK to apply for membership. At this point you need to wait for the Auth Director to log on, verify you, and accept your application. YOU NEED TO BE COMPLETLY SURE THAT YOU HAVE DROPPED ANY PREVIOUS ROLES FROM A CORP. The general rule is that you'll be left in the queue once, and if you still have roles the next time the Auth Director logs on your application will be rejected. If at any point you have failed to complete something in GSOAR before applying your app will be rejected and you will receive a form letter letting you know that you are dumb and providing a link to this wiki page. While you wait to be accepted (this can take a matter of minutes to a couple of days), there are plenty of things you can do. 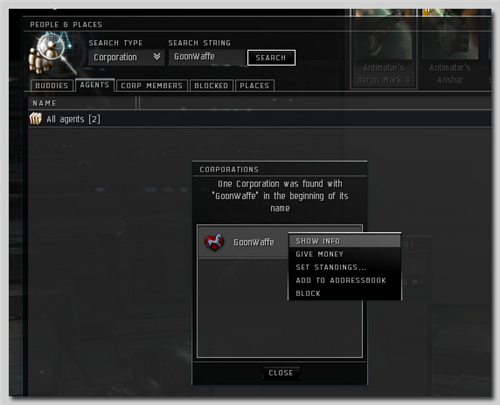 Don't forget to join the in-game channel SOLOHELP to beg for isk from your new space brosefs..
7.d Keep in mind that when logging into goonfleet.com you will need to use your email rather than your forums name. After clicking Register Forum Account, GSOAR will take you to the Groups page. As a newbie, most of these will not apply to you with the exception of the squads, which are covered in https://wiki.goonfleet.com/index.php?title=Squads. 7.e From this point you should be able to log into the forums and change your password to something that isn’t completely random. 8.c At this point you are done with your registration. Have a party to celebrate. 1. When adding your API into GSOAR to put in your characters you may just get a white screen. First try to refresh and resend the page a couple of times to see if that clears it. If not, try backing your browser up the same number of times you refreshed. This is not guaranteed to work but has been successful in the past. 2. Sometimes you may have issues with cookies that won’t allow you to resume or start a new application and instead just takes you back to the login screen. Running CCleaner may work, though clearing cookies/temp files may do fine as well.